Note: this is part of a series in which I discuss works of the contributors to The Other Half of the Sky. Links to other entries in the series appear at the end of each discussion. Preamble: In October of 2010, I wrote an essay for the blog of Apex Magazine in response to a then-regular columnist’s whinings about “quality compromised by diversity and PC zombies” in life as well as speculative literature. Later on the Apex site was hacked, and its owner decided not to go through the laborious work of restoring its archive. In view of the recent discussions about women in SF (again… still…) and as a coda to The Other Half of the Sky, I’m reprinting the essay here, slightly modified. Shamsia and Atifa Husseini, who still go to school after the Taliban threw acid on their faces. Cultural standards of politeness vary widely. In the societies I’m familiar with, it’s considered polite (indeed, humane) to avert one’s eyes from someone who has pissed himself in public, especially if he persists in collaring everyone within reach to point out the interesting shape of the stain on his trousers. At the same time, if he also splattered on my great-grandmother’s hand-embroidered jacket to demonstrate how he – alone among humans – can direct his stream, I’m likely to ensure that he never comes near me and mine again in any guise. Yet I must still put time and effort into removing the stain from that jacket, which I spent long hours restoring and further embroidering myself. It’s not the only stain the garment carries. Nor are all of them effluents from those who used it and its wearers as vessels into which to pour their insecurity, their frantic need to show themselves echt members of the master caste du jour. The jacket also carries blood and sweat from those who made it and wore it to feasts and battles long before I was born. Unless it’s charred to ashes in a time of savagery, probably with me in it, many will wear it after me or carry its pieces. Whenever they add their own embroidery to cover the stains, the gashes, the burns, they won’t remember the names of the despoilers. And when my great-grandniece takes that jacket with her on the starship heading to Gliese 581, her crewmates will admire the creativity and skill that went into its making. So gather round, friends who can hoist a goblet of Romulan ale or Elvish mead without losing control of your sphincter muscles, and let’s talk a bit more about this jacket and its wearers. If you insist that only sackcloth is proper attire or that embroidery should be reserved only for those with, say, large thumbs, we don’t have a common basis for a discussion. But I’ll let you in on a couple of secrets. I’ve glimpsed my nephews wearing that jacket, sometimes furtively, often openly. They even add embroidery patches themselves. And strangely enough, after a few cyclings I cannot guess the location of past embroiderers’ body bulges from the style of the patches or the quality of the stitches. I like some much more than others. Even so, I don’t mind the mixing and matching, as long as I can tell (and I can very easily tell) that they had passion and flair for the craft. In one of the jacket’s deep pockets lies my great-grandmother’s equally carefully repaired handmade dagger, with its enamel-inlaid handle and its blade of much-folded steel. When I see someone practicing with it, on closer inspection it often turns out to be a girl or a woman whose hair is as grey as the dagger’s steel. They weave patterns with that dagger, on stone threshing floors or under skeins of faraway moons. Because daggers are used in dance – and in planting and harvesting as well, not just in slaughter. And they are beautiful no matter what color of light glints off them. But before we dance under strange skies, we must first get there. Starships require a lot of work to build, launch and keep going. None of that is heroic, especially the journey. Almost all of it is the grinding toil of preservation: scrubbing fungus off surfaces; keeping engines and hydroponic tanks functional; plugging meteor holes; healing radiation sickness and ensuring the atmosphere stays breathable; raising the children who will make it to planetfall; preserving knowledge, experience, memory while the ship rides the wind between the stars; and making the starship lovely – because it’s our home and people may need bread, but they also need roses. As astrogators scan starmaps and engineers unfurl light sails while rocking children on their knees, the stories that keep us going will start to blend and form new patterns, like the embroidery patches on my great-grandmother’s jacket. Was it Lilith, Lakshmi Bai or Anzha lyu Mitethe who defied the ruler of a powerful empire? Amaterasu, Raven or Barohna Khira who brought back sunlight to the people after the long winter sleep? Was it to Pireus or Pell that Signy Mallory brought her ship loaded with desperate refugees? Who crossed the great glacier harnessed to a sled, Sidney Poitier and Tony Curtis, or Genly Ai and Therem harth rem ir Estraven? Our curiosity and inventiveness are endless and our enlarged frontal cortex allows dizzying permutations. We shape the dark by dreaming it, in science as much as in art; at the same time, we constantly peer outside our portholes to see how close the constructs in our heads come to reflecting the real world. Sometimes, our approximations are good enough to carry us along; sometimes, it becomes obvious we need to “dream other dreams, and better.” In storytelling we imagine, remember, invent and reinvent, and each story is an echo-filled song faceted by the kaleidoscope of our context. To confine ourselves to single notes is to condemn ourselves to prison, to sensory and mental deprivation. 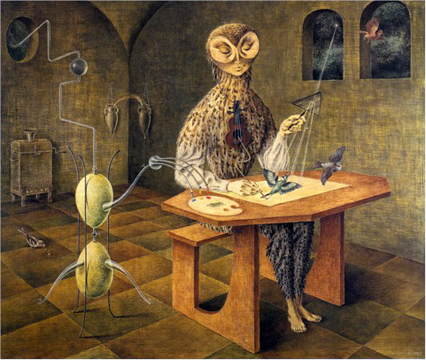 Endless looping of a single tune is not pleasure but a recognized method of torture. It’s certainly not a viable way to keep up the morale of people sharing a fragile starship. In the long vigils between launch and planetfall, people have to spell each other, stand back to back in times of peril. They have to watch out for the dangerous fatigue, the apathy that signals the onset of despair, the unfocused anger that can result in the smashing of the delicate machinery that maintains the ship’s structure and ecosphere. People who piss wantonly inside that starship could short a fuel line or poison cultivars of essential plants. The worst damage they can inflict, however, is to stop people from telling stories. If that happens, the starship won’t make it far past the launchpad. And if by some miracle it does make planetfall, those who emerge from it will have lost the capacity that enabled them to embroider jackets – and build starships. We cannot weave stories worth remembering if we willingly give ourselves tunnel vision, if we devalue awareness and empathy, if we’re content with what is. Without the desire to explore that enables us to put ourselves in other frames, other contexts, the urge to decipher the universe’s intricate patterns atrophies. Once that gets combined with the wish to stop others from dreaming, imagining, exploring, we become hobnail-booted destroyers that piss on everything, not just on my great-grandmother’s laboriously, lovingly embroidered jacket. The mindset that sighs nostalgically for “simpler times” (when were those, incidentally, ever since we acquired a corpus collosum? ), that glibly erases women who come up with radical scientific concepts or write rousing space operas is qualitatively the same mindset that goes along with stonings and burnings. And whereas it takes many people’s lifetimes to build a starship, it takes just one person with a match and a can of gasoline to destroy it. It’s customary to wish feisty daughters on people who still believe that half of humanity is not fully human. I, however, wish upon them sons who will be so different from their sires that they’ll be eager to dream and shape the dark with me. 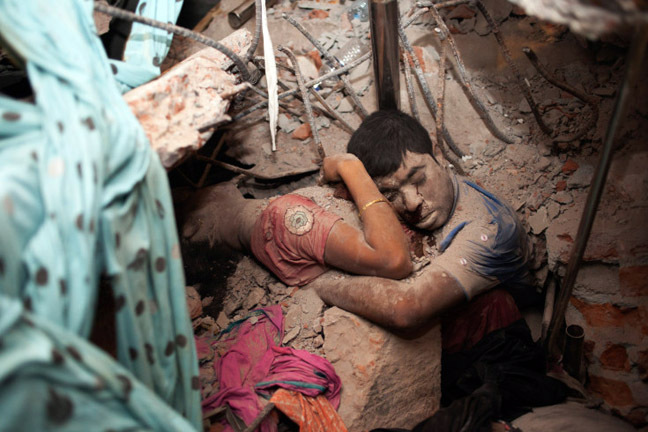 — father of one of the more than 900 workers killed in the illegally, shoddily constructed garment factory that collapsed in Savar, Bangladesh on April 24, 2013. Photo by Taslima Akhter, Bangladeshi activist and photographer, who comments on it here. Note: this is part of a series in which I discuss works of the contributors to The Other Half of the Sky. Other entries in the series appear at the end of each discussion. 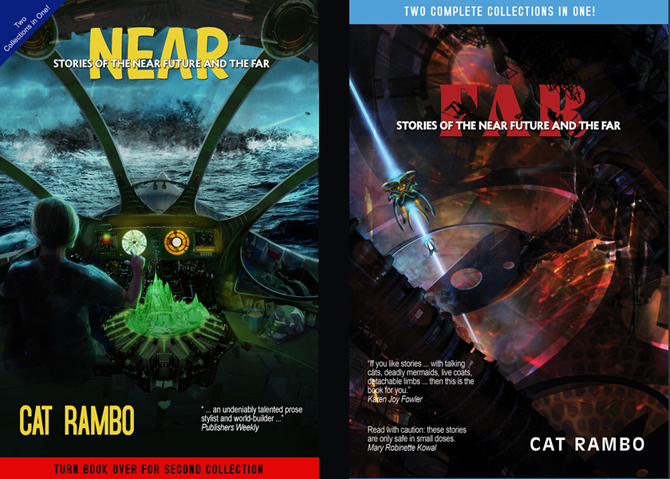 Cat Rambo’s recent collection, Near + Far (Hydra House, $16.95 print, $6.99 digital), is a tête-bêche book containing 2×12 stories of wildly different lengths that previously appeared in such venues as Abyss and Apex, Clarkesworld, Clockwork Phoenix, Crossed Genres, Daily SF and Lightspeed. Before I discuss the stories themselves, I’ll mention two secondary but important aspects of the book. One is the attention paid to the presentation; as one example, the text ornaments are almost distracting in their beauty. The other is that each story has an afterword in which Rambo gives its backstory and worldpath. Personally, I greatly enjoy such fore/afterwords (I still fondly recall Harlan Ellison’s needle-sharp, needling introductions) and find that they invariably deepen my understanding and appreciation of the tale – provided that the writer knows their craft. Which brings us to the content of the collection. 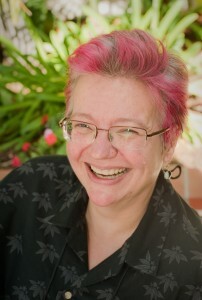 Cat Rambo is a chameleon – a type of writer as rare as a Hollywood actor who can submerge themselves into a character. Rambo’s range is galaxy-wide: she goes from near-future quasi-dystopia to far-future space opera, from slapstick humor to Eurypidean tragedy, with deceptively effortless prose, like a prima ballerina executing grandes jetés. She also has a flair for the telling snippet that brings a person or setting to sharp, vivid life, like the pass of a lighthouse beacon. The Near and Far halves hew to their titles: the former keeps close to home in spacetime, the latter ventures further afield. Yet common kernels underlie these thematically and stylistically far-flung worlds: the complexity of relationships (the frictions of long-term pairings in particular) and, obversely, the urgent desire for connection even at a steep cost. Everything is scaled to personal dimensions, even in the space operas. There’s a noticeable transhumanist overlay to the cycle (AIs of various sentience levels and nanobiotech-based modifications are ubiquitous), though it never devolves to the tiresome paradise/hell binary. Instead, Rambo focuses on the dilemmas of autonomy, privacy and community. She also eschews neat resolutions. Most of the stories end ambiguously or remain open-ended; many are bleak, though in a pragmatic, low-key way that makes them poignant. Several of the stories in Near are about failing connections. “Peaches of Immortality” is a downbeat version of Groundhog Day that renews the frisson associated with high school cliques. “Close Your Eyes” and “Not Waving but Drowning” are unflinching examinations of issues that corrode relationships: the friction between a sister taking care of her dying brother in the former, the unraveling of trust that results from excessive transparency in a marriage in the latter. 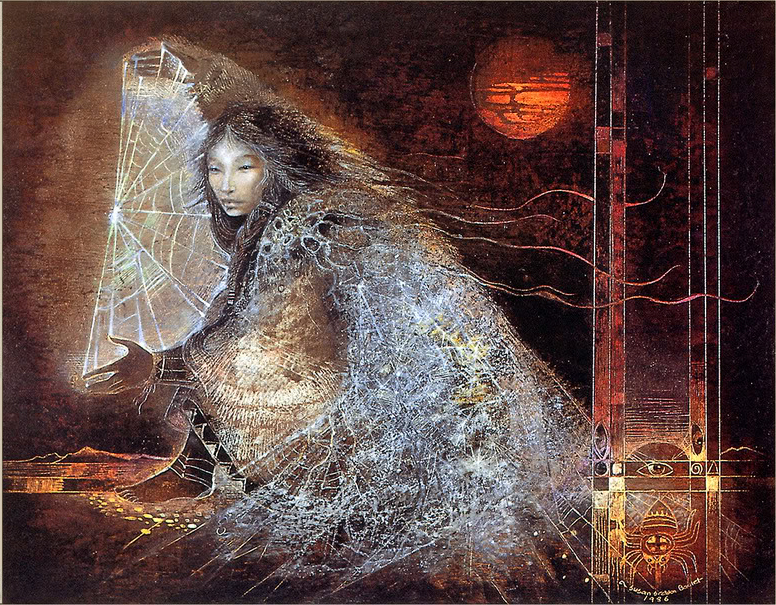 “Therapy Buddha” and “Long Enough and Just So Long” are investigations into consciousness: the first illustrates the placebo effects of an ELIZA-type program; the second is Tanith Lee’s Silver Metal Lover shorn of its romantic trappings. “RealFur” is a story of suffocation on several levels whereas “Vocobox™” is about the loneliness of togetherness when the fit is bad. My favorite stories in Near show harsh worlds where loyalty and companionship are nevertheless possible and make a difference. “The Mermaids Singing Each to Each” is a retelling of The Old Man and the Sea in a universe where gender fluidity is easy – and an AI can earn forgiveness for a betrayal. “Memories of Moments, Bright as Falling Stars” is what Strange Days could have been if Kathryn Bigelow had not pulled her punches about the repercussions of brain enhancements in a pyramidal-privilege society. “Legends of the Gone” portrays the world going out not with a bang, but with a whimper… yet its subdued notes are oddly consoling, perhaps because dying humanity has remained humane. Heading for the antipodes, some of the Far stories are actually between Near and Far. Taking off from Near, “Zeppelin Follies” and “Surrogates” contemplate futures in which humans interact with the world through filtering devices. Landing at Far, “A Querulous Flute of Bone” and “Five Ways to Fall in Love on Planet Porcelain” explore desire in unique settings that are nevertheless reflections of our internal landscapes. Far showcases Rambo’s prowess at creating intriguing, thought-provoking worlds and aliens. Several stories in Far delve into the longing to belong and also explore other senses beyond the dominant human one of vision. At the humorous end, “Kalakkak’s Cousins” is Deep Space 9 via Lucky Luke’s bumbling Dalton brothers. In the still-hopeful middle are “Seeking Nothing” and “Angry Rose’s Lament” whose misfit protagonists voluntarily choose submersion into group minds to allay loneliness. At the sorrowful end, “Amid the Words of War” shows a doomed alien outcast with surprisingly universal needs. Aliens of a different kind are depicted in “Timesnip” in which a time-transported suffragette catalyzes a revolution (actually, a restoration) in a planetfall society that has turned the Oedipal configuration into a requirement for male adulthood. Far closes with “Bus Ride to Mars”, a slipstream version of the Canterbury Tales. However, the piece in Far that plucked a strong resonating chord in my mind was its opening: “Futures” is a flash story that encompasses all the universes in the anthology – plus many more. With its limpid, lapidary glimpsed views through doors held ajar, it’s the most evocative piece in the collection, the one that induces the yearning triggered only by the highest quality SF. I’ve kept the descriptions of the stories in Near + Far deliberately brief and vague; they’re far more complex and intricate that these soundbites indicate. It’s my fond hope that the crumbs I dropped have made everyone hungry enough to devour the entire collection. It’s a generous, savory meal that rewards the discerning palate. Some may recall that, back in January, the reprint of “Planetfall” at the World SF site caught the eye of Nowa Fantastyka, a prominent, long-lived Polish SF/F magazine. 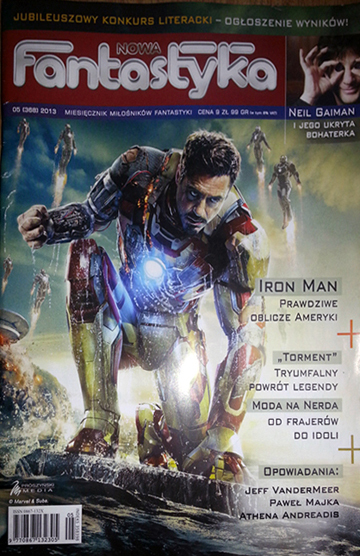 They asked me if they could publish the story in Polish. I asked fiction editor Marcin Zwierzchowski if it was all right for my friend Aneta Bronowska to vet the translation, since my Polish is non-existent. Aneta combines three attributes that made her ideal for this task: she was born in Poland and has lived there all her life; she has exquisite antennae; and she’s intimately familiar with the Spider Silk universe. I knew the translation was good when Aneta said it made her cry, like its English original. 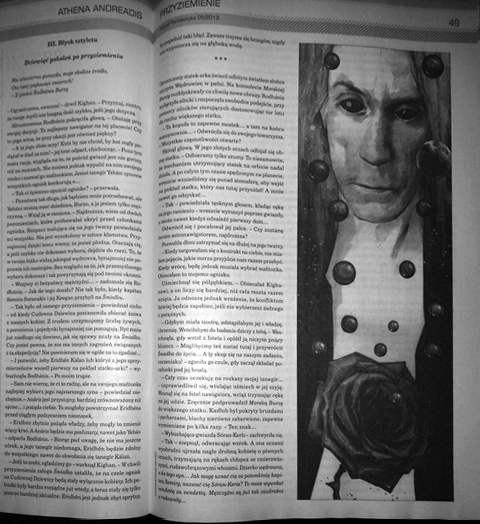 The Nowa Fantastyka issue with my story just appeared: here’s a link to a promotional copy of the magazine that shows selected pages. 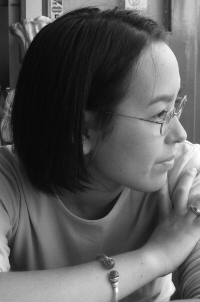 This is the second translation of my work — To Seek Out New Life came out in Japanese — but the first one of my fiction. The promotional file does not show that the story bears an illustration that Aneta was kind enough to scan and send me. 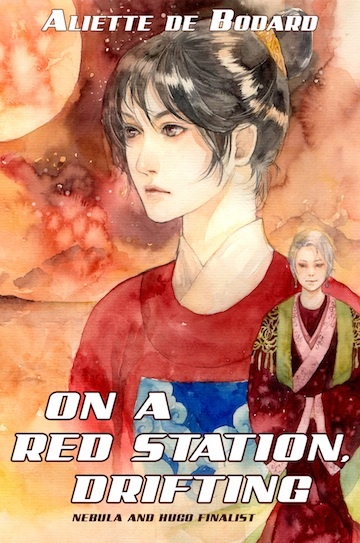 It’s a lovely, otherworldly rendition that encapsulates nearly all the elements in the story – except for the amulet/command module that traverses each portion of the story like a falling star. My thanks to Lavie Tidhar, Sarah Newton, Marcin Zwierzchowski and Aneta Bronowska, who made this possible. You are currently browsing the Astrogator's Logs weblog archives for May, 2013.